Tilly Mint Silver is absolutely delighted to be suppling Fine Silver gingerbread men earrings to Grasmere Gingerbread. Tilly has made a return to Folksy where a limited number of items will be listed on a regular basis. 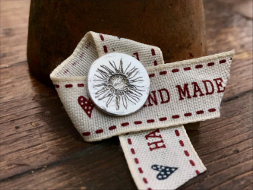 Etsy and local retailers will remain the main outlets for Tilly Mint Silver items, however in order to offer more outlets Tilly is making a comeback after an absence on Folksy of a few years. 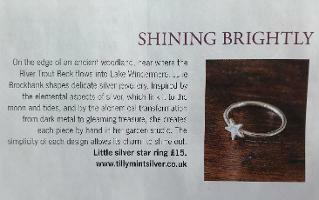 Landscape Magazine have very kindly featured my little silver star ring in the December 2018 issue of their gorgeous magazine. Tilly Mint Silver made a little appearance in the May 2017 issue of House Beautiful Spring Collection. This website and its content is copyright of Tilly Mint Silver2017© Tilly Mint Silver is a Registered Trade Mark All rights reserved.